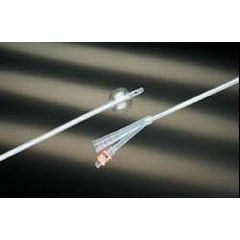 The Bard 100% latex-free Uncoated Silicone Foley Catheter is available in a variety of French sizes and balloon sizes. This specific model comes with a 3cc balloon. Please follow proper inflation techniques and use 5cc of sterile water to inflate the 3cc balloon completely. Under-inflation may cause leakage or slippage of the indwelling catheter.